If you’ve watched GSP’s recent fights you’ll notice a peculiar pre-fight ritual of his, spitting water on himself. After stepping into the Octagon GSP has a habit of taking a sip of water then spitting the water in the air over his head letting it land on him. Whether this is a a harmless habit or an intentional step to gain advantage, the move arguably breaks the rules. Taking his home jurisdiction of Quebec, Section 69 of the Regulation Regarding Combat Sports requires that ” A contestant shall not use grease or another substance on his face, arms or other parts of his body“. Looking at Nevada’s rules for unarmed combat which will be in force for GSP’s next scheduled title defence, two sections come into play which also likely prohibit this conduct. NAC 467.598 Subsection 2 prohibits “The excessive use of…any other foreign substance….on the face or body of an unarmed combatant. ” And goes on to require the referee or the Commission’s representative in charge to “cause any excessive….foreign substance to be removed.” GSP’s actions arguably don’t infringe this section as the amount of water may not be considered ‘excessive’ however a further section contains a similar prohibition without this modifying word. NAC 467.7962 Subsection 32 prohibits the application of “any foreign substance to the hair, body, clothing or gloves immediately prior to or during a contest or exhibition that could result in an unfair advantage.” There is no doubt that water is a “foreign substance“. The only question is whether a coating of water “could result in an unfair advantage“. 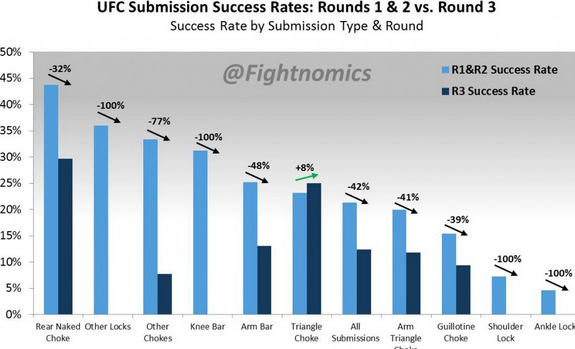 Appreciating the dwindling submission rate in later rounds due in part to combatant perspiration it is arguable that a coating of water to start the fight creates an unfair advantage.